This weekend we said good-by to some old friends. They have been with us since we got married, 14 years ago. They have put up a lot from us. We moved them 10 times over the years with little bump and scraps, but they got over it. When they started to breakdown we made sure to get them healed. We could not live without them. They had a very important job to do for us. Clean our clothes. Yes, I'm talking about our washer and dryer. Over the past year they have been going down hill. Like taking 2 hours to dry clothes. Not cool!!! So we finally decided last week to go ahead and get new ones. 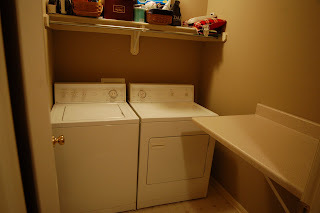 ... and HELLO to high efficiency washer and dryer!! In RED!!! I Love them!! No, I did not sit and watch my clothes get clean and no, I do not stop to take a peek at them every time I walk past the laundry room. Not me!! I have better things to do. Like mother like daughter. They like watching the clothes too. Ok, not as much as mommy. Ok, well I must go and check on my washer and dryer, oops I mean do some laundry. I hate doing laundry, just kidding I love it!!! Whoooo Hoooo!!! congrads, on your new members. but you know what, i bet that mommy does peak in to check on the new ones when no one is looking. its ok to look at them . ha. ha. love you all . dad perry. I love them!! 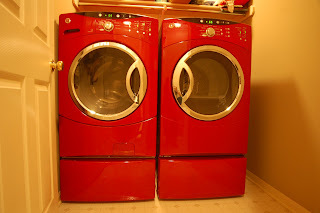 We want to get new washer and dryer but ours will have to fall dead before we get them :) LOVE THE RED!! They are so shiny! 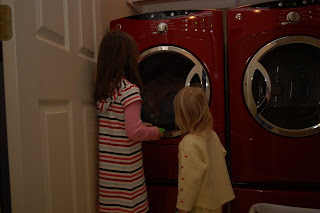 Enjoy watching your clothes wash and dry...a stay at home mom's excitement for the day!